Write Score fully aligns to the Smarter Balanced standards for English Language Arts K-12 for Writing and provides materials to help measure and instruct on those standards. Students who use our hand-scored assessments have a testing experience that is very similar to the Smarter Balanced Assessment in both structure and difficulty. Each assessment includes grade-appropriate articles with annotated text features, selected response questions relayed in the scaffolding system, short constructed response question (grades 3-12), and one long performance task essay prompt in your chosen genre. Assessments are administered via our online testing platform (when paper-pencil tests are not selected) which has a look and feel similar to the online Smarter Balanced platform. Digital tools in our online platform function similarly to those on the Smarter Balanced, allowing for students to practice and become comfortable. ​After essays are submitted for scoring, data results are returned quickly via an online teacher data report which breaks the scoring down into the three reporting categories: Organization/Purpose, Evidence/Elaboration and Conventions. Within those reporting categories, specific response detail information helps provide targeted data to use in monitoring specific aspects of students’ writing and in making instructional decisions. For example, teachers will receive information on students’ proficiency with writing introductions and conclusions, incorporating attributions, writing with focus, and much more. Grades K-2 available genres include Opinion, Informational, and Narrative Writing. Students will be focused on developing comprehension strategies that will enable them to manipulate grade-level texts of appropriate complexity, and communicate effectively in writing. Students will begin to anchor their responses firmly to the text, whether literary or informational, using specific and relevant evidence to support their claims and inferences. One Selected Response Question and Two Constructed Response Questions that scaffold students’ understanding of the articles and help prepare them for the culminating essay response task. Our assessments are provided for students’ use in our online student testing portal or in paper/pencil format. Our professional scorers go beyond just reporting analytical scores in each of the three reporting categories: Organization/Purpose, Evidence/Elaboration and Conventions. Within those reporting categories, specific response details help identify weaknesses within a student’s writing and in making instructional decisions. 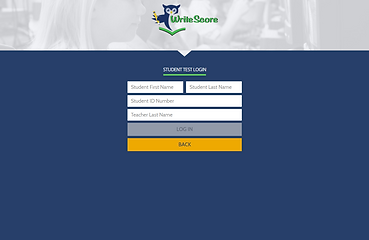 Write Score’s targeted instruction to improve writing is further simplified with our one-click bank of instructional materials, directly from the Educator Portal. Lesson plan sets are written to state standards in the gradual release of responsibility model. Our engaging and structured bank of lessons help keep students’ interest for optimal learning!